MOBA showcases a rotating collection of 400 bad artworks, all within the confines of the museum’s galleries — two Massachusetts basements. I have to admit, I really like a lot of the collection’s pieces. 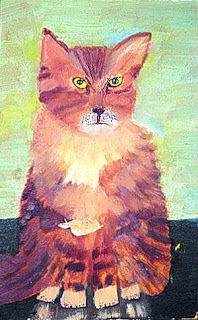 This portrait of Peter the Kitty by Mrs. Jackson is fantastic — the hole in the middle of the canvas just adds to the appeal.